Once again Brandon is the ideal place to tour the 21st Vermont Open Studio Weekend, due to the heavy concentration of studios in town open to the public. The Vermont Crafts Council (VCC) maps are already available at the Brandon Artists Guild (BAG), a designated site on the map. Patty Sgrecci, whose colorfully refreshing kinetic art is featured at the BAG this month, will receive her visitors at that location. Nine other BAG artist members can be found in their own studios: Mike Mayone, Susan Smith-Hunter, Warren Kimble, Judith Reilly, Kathy Malillo, Karen Deets, Stacey Stanhope, Stacie Mincher, and Althea Bilodeau. Of these, ceramic sculptor Smith-Hunter, painter Warren Kimble, and fabric artist Judith Reilly are located in Brandon proper, while the other locations can be found on the VCC’s map. Also in Brandon are these following non-Bag artists: photographers Don Ross and Caleb Kenna, weaver Lee Greenwalt, stained-glass artist Laura Rideout, and painter/sculptor Joan Curtis. 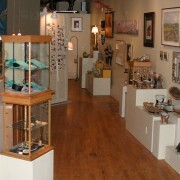 Visitors cannot help but be enticed by the convenience of ten artist studios within walking distance in the charming village of Brandon, in the midst of exciting shops and restaurants. Two hundred and forty-two artists participate in this statewide event. Look for the bright yellow signs as you drive around! May 25 & 26; 10 AM to 5 PM.